Bill and Bernardine lead an engaging and often very funny community conversation at The Rag Blog’s launch party — all captured on Bob Simmons’ video! 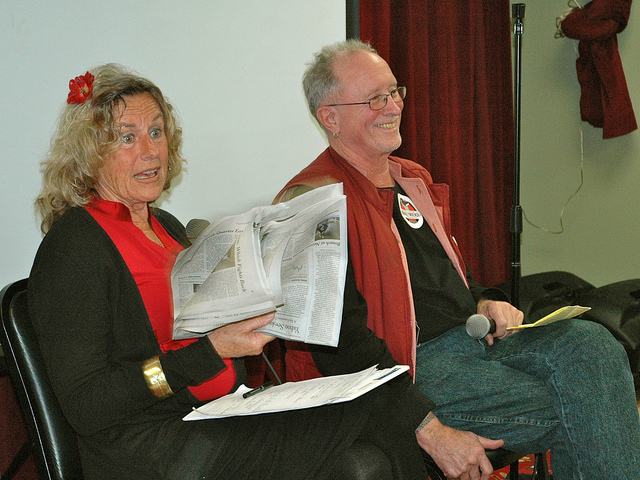 Bill Ayers and Bernardine Dohrn host an entertaining and provocative discussion at The Rag Blog‘s launch party for its new website, January 17, 2014. Video by Bob Simmons / The Rag Blog. You can also watch it on YouTube. AUSTIN, Texas — The Rag Blog launched it’s new website (TheRagBlog.com) before a large and receptive crowd at an event billed as “The Underground Goes Overboard,” a lively “launch party” held at Austin’s 5604 Manor Community Center on January 17, 2014. The event, produced by the Friends of New Journalism, featured live performance by the Melancholy Ramblers, ample beer and barbeque, and an hour-long presentation by activist-scholars — and former Weather Undergrounders — Bill Ayers and Bernardine Dohrn, who had been our guests on Rag Radio earlier that day. Ayers and Dohrn led an enthusiastic public conversation — always engaging and frequently very funny — as they interacted with a packed roomful of political activists, alternative journalists, musicians, environmentalists, progressive politicos (including a smattering of elected officials), labor activists, hippie elders, old-time Austin radicals, and random fellow travelers. Ayers and Dohrn at Rag Blog launch party. Photo by Carlos Lowry / The Rag Blog. The wide-ranging discussion covered war and peace, prisons, workers’ rights, public education, the Occupy Movement, and the “mythology of the Sixties.” And Ayers’ heads-up about a potential American-style fascism that would include bike lanes and legal marijuana. Austin renaissance media man Bob Simmons captured the entire presentation in a polished and riveting video. You can watch the video, edited by Simmons and Jasper McCollum, at the top of this piece or at YouTube. And also check out Bob’s excellent video of our Rag Radio interview with Ayers and Dohrn, as well as the podcast of that show, here. The Rag Blog is a progressive Internet news magazine that has hosted more than 10,000 posts and 2 million unique visits since its inception in 2006. 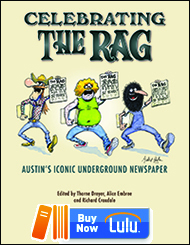 Along with Rag Radio, The Rag Blog is a digital-age rebirth of Austin’s legendary underground newspaper, The Rag, published from 1966-1977. The Rag Blog is published by the New Journalism Project, a Texas 501(c)(3) nonprofit. 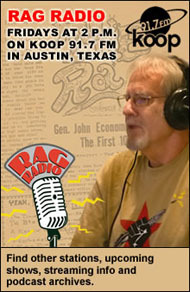 Also see Bob Simmons’ video of our January 17, 2014, Rag Radio interview with Bill Ayers and Bernardine Dohrn. 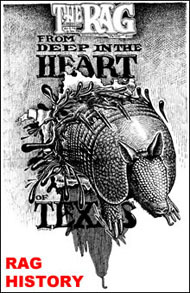 This entry was posted in RagBlog and tagged Austin Activists, Bernardine Dohrn, Bill Ayers, Bob Simmons, New Left, Peace Movement, Rag Bloggers, Sixties, The Rag, The Rag Blog, Thorne Dreyer, Underground Goes Overboard, Video, Weather Underground. Bookmark the permalink.